View The Momentum III floor plan for a 1860 Sq Ft Palm Harbor Manufactured Home in Tulsa, Oklahoma. The Momentum III manufactured home by Palm Harbor has 1,860 square feet of living space with 4 bedrooms and 2 baths. And if 4 bedrooms is too many for you, turn one of them into an optional entertainment room or home office. Welcome home to The Momentum III double wide manufactured home by Palm Harbor Homes 4 Bedrooms, 2 Baths, 1,860 Sq. Ft. Same angle in another Momentum III model home, this one with optional built-in entertainment center dividing the kitchen from the living room. This feature is optional on the Momentum III, so ask your sales person about it if you are interested. Beautiful and spacious living room with tons of natural light! The Momentum III double wide manufactured home by Palm Harbor Homes 4 Bedrooms, 2 Baths, 1,860 Sq. Ft.
Space for the WHOLE family to gather in The Momentum III double wide manufactured home by Palm Harbor Homes 4 Bedrooms, 2 Baths, 1,860 Sq. Ft.
Again, this is another Momentum III model home, with optional built-in entertainment center dividing the kitchen from the living room. This feature is optional on the Momentum III, so ask your sales person about it if you are interested. This living area is easily accessible from every area of the Momentum III double wide manufactured home by Palm Harbor Homes 4 Bedrooms, 2 Baths, 1,860 Sq. Ft.
Amazing chefs kitchen in the Momentum III double wide manufactured home by Palm Harbor Homes 4 Bedrooms, 2 Baths, 1,860 Sq. Ft. Extra bar seating along the kitchen island - The Momentum III double wide manufactured home by Palm Harbor Homes 4 Bedrooms, 2 Baths, 1,860 Sq. Ft. Compared with the last kitchen photo, this one is shot in another Momentum III model home, with optional built-in cabinets (left side of photo here) dividing the kitchen from the living room. This feature is optional on the Momentum III. Great storage space beneath the island in the Momentum III double wide manufactured home by Palm Harbor Homes 4 Bedrooms, 2 Baths, 1,860 Sq. Ft. Same kitchen view with optional built-in divider (to the right of the frame) which serves as an entertainment center for the living room side, plus beautiful buffet cabinets on the other side here, with plenty of extra kitchen storage. Nice big window above the kitchen sink allowing lots of natural light to shine in the Momentum III double wide manufactured home by Palm Harbor Homes 4 Bedrooms, 2 Baths, 1,860 Sq. Ft.
From dining room to kitchen - the Momentum III double wide manufactured home by Palm Harbor Homes 4 Bedrooms, 2 Baths, 1,860 Sq. Ft.
Fabulous dining area with space for the whole family in the Momentum III double wide manufactured home by Palm Harbor Homes 4 Bedrooms, 2 Baths, 1,860 Sq. Ft.
You will have plenty of space for you king size furniture! Stunning master bath with dual vanities! No more early morning traffic jams! HUGE soaker tub! How would you like to come home and soak away the days stress? You certainly can in the Momentum III double wide manufactured home by Palm Harbor Homes 4 Bedrooms, 2 Baths, 1,860 Sq. Ft.
BIG shower to compliment that awesome soaker tub! Great built-in shelving around the toilet! Even room for a sitting area in the master bath!!! Look how beautiful the vanities are! Spacious secondary bedrooms in the Momentum III double wide manufactured home by Palm Harbor Homes 4 Bedrooms, 2 Baths, 1,860 Sq. 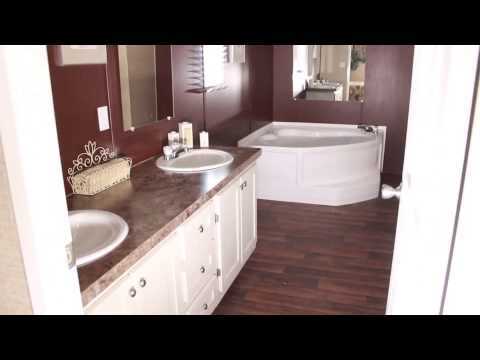 Ft.
A wonderful secondary bathroom with lots of space! Spacious utility room with washer and dryer connections installed in the Momentum III double wide manufactured home by Palm Harbor Homes 4 Bedrooms, 2 Baths, 1,860 Sq. Ft.
320 S. 129th East Ave.